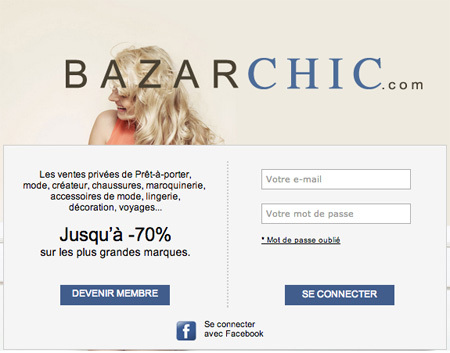 Home Ecommerce Platform Is Social Login Right For Ecommerce? Usability god Jared Spool’s famous case study of a $25 Billion online retailer (that shall remain nameless…okay, it’s Amazon) found that 45% of its customer file had multiple registrations, some as many as ten – thanks to an inability to remember registered passwords. Offering guest checkout improved conversion by 45% — but that was 2009, before social login hit the scene and offered a speedy one-click registration alternative. Facebook, Twitter, Google+, Gmail, Instagram and most of the major social networks support social login, and their adoption is growing across the Web. But are they appropriate for ecommerce? Let’s face it, we all suffer from too many passwords to remember. 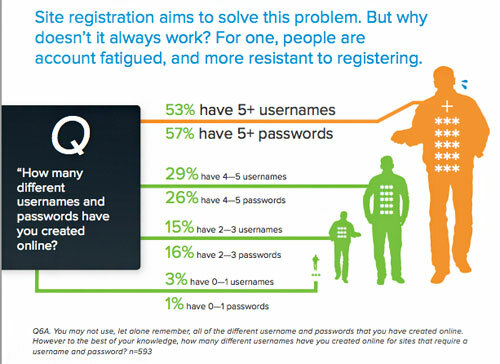 According to a recent study by Janrain, over half of us have more than 5 user names and passwords to remember. When new account registration appears too tedious, 4 in 5 consumers admit to giving incorrect or incomplete information, such as email addresses, name, etc (Janrain). Even worse, 92% report they’ve abandoned a site rather than attempt credential recovery. Social log in mitigates false information and abandonment both by making sign up as quick and easy as possible, while porting over useful and correct profile data. 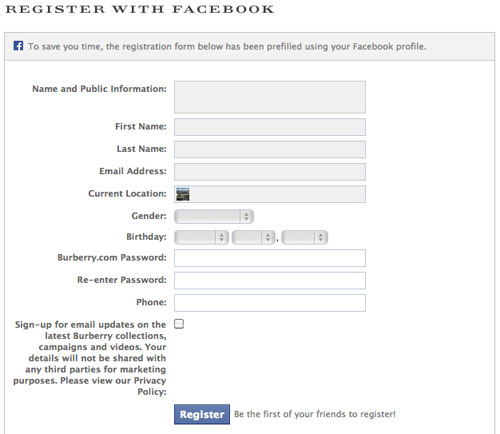 Some sites, like Burberry, pre-fill form fields with profile information to speed up the process. Consumers are also more familiar with social login, with 87% reporting they have seen it, and only 13% that have not. 52% have actually used it to register, and the same percentage expect that their post-registration experience will be better thanks to social login. 65% say they’re more likely to return to a website that automatically signs them in with their social credentials. Consumers are most open to using Facebook to sign on, with 27% saying they’d “absolutely” use it (Janrain. Twitter and Instagram are the runners-up with 19% and 18%, respectively. However, a study by Betapond earlier this year found only 6% of US 14.5% of EU ecommerce sites are Facebook login. In addition to higher registration and checkout conversion rates, repeat visits and more satisfied customers, social login helps with social merchandising. While its effectiveness depends on how many of a customer’s friends have interacted with your site, the targeted social proof can be effective. 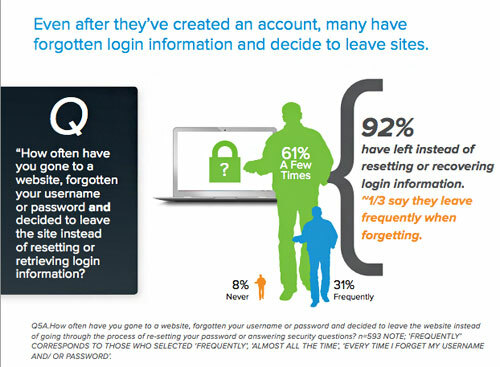 Are there downsides to social login? 1. It’s not an A/B-testable implementation You don’t know if offering the connection boosts or hurts registration conversion, really, unless you test it with your own customers, despite what all these juicy stats imply. 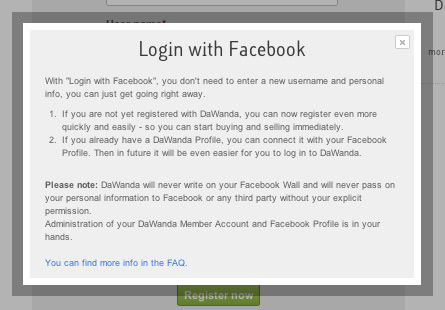 Once you enable customers to sign up with Facebook or any other social connection, reversing the action is difficult. 2. Social networks drop like flies Consumers like a bit of choice, but you can go overboard by offering too many login choices, and risk the event that a social network disappears (like Instagram, Yahoo or Foursquare), you have a bigger problem on your hands – customers need to re-register. 3. Accidental authentication Shared devices mean some users can auto-authenticate when they shouldn’t. Customers typically don’t think to sign out of ecommerce sites at the end of their session, they’re more likely to simply close their browsers. It’s possible unauthorized activity may be disputed through chargebacks. I can’t tell you that social sign on will lift your sales or hinder them — you need to determine whether the pros outweigh the potential cons outlined above and judge whether you want to take on the risk and the reward. I do advise that if you decide to go ahead, stick with either just Facebook, or Facebook and Twitter, the 2 most common and most desired social login options. (Remember the paradox of choice, more conversion buttons requires more thinking, and typically leads to less action). You also don’t want to take on the risk of a social network losing popularity or going out of business and taking your customer accounts with it. More fields = more risk for abandonment. Ask only for information you’ll actually use to personalize the customer experience or for customer segmentation. Also consider that asking to access friends’ information can be a turn-off. Privacy-paranoid customers may not understand these permissions are optional. Styling your buttons too close to Facebook’s color and shape can cause confusion. It’s more clear to make a visual distinction between the 2 options. 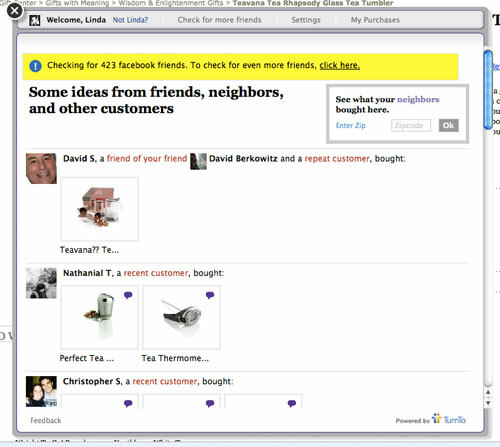 Social connection eliminates the need to create a password. Take advantage of this!